Studio City (Perfect Meal Today) 1/23/17/–This restaurant in the crowded dining scene on Ventura Blvd in Studio City Is close to being open 1 year, and my bet is that it will be around for quite some time. 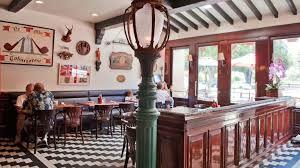 Excellent atmosphere and a really friendly staff complement the excellent work of chef/partner Paddy Aubrey in what can very loosely be described as American comfort food. 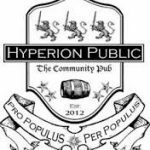 Apparently he made his name with his Mac & Cheese dish but now can he can claim to having several other at Hyperion Public. 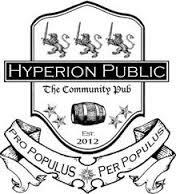 It is also known as a community pub and as expected does roaring business on the weekend. The menu is nicely set up for sharing so an obvious starter would be the Asian Steak Lettuce Cups ($13), a dish full of flavor thanks to the pickled carrots, bacon coleslaw and cilantro. When it comes to the salads then try the Brussels Sprout Cobb ($13), a gargantuan feast including crispy Brussels sprouts, chopped eggs, cherry tomatoes, applewood bacon, and crumbled blue cheese in a potent balsamic reduction. Speaking of the Mac & Cheese the menu contains Aubrey’s famous Truffle Mac & Cheese with truffled mushrooms, smoked gouda and Panko crust. This writer has personally no interest at all in this particular style of food, but my guest seemed well impressed so it must be a particularly good seller. Star of the show for me was General Tso’s Uncle Riki’s Fish ($23) a pan seared snapper that is served with a crispy rice, grilled lemon-herb bok choy and a chili paste. Fans of Southern food also have the Shrimp n’ grits to choose from, Aubrey’s take on the Southern classic with pan-seared shrimp, very creamy grits, andouille sausage and a bourbon shrimp reduction. Also notable is the Roast Chicken ($23), a free range organic half chicken well complemented with faro, oyster mushrooms, roasted squash, kale and cauliflower. They have also built a nice little bar that sends out some creative cocktails but it was the desserts that also complemented the food that preceded them. How about the Mexican Chocolate Pudding, a sublime creation with cheesecake, whipped cream and a graham cracker crust. Even better was the Salted Caramel Pie with vanilla bean whipped cream that was so flavorful it was impossible not to whoof down. I just remembered that I forgot to mention the burgers which by all accounts are special here. Chicken with Attitude ($15) looked particularly interesting comprising of a fried chicken breast w/crispy onions, bacon coleslaw, roasted jalapenos, sliced dill pickles and a BBQ Blue Cheese dressing. For vegetarians they have the Veggie Banh Mi Black Bean Patty ($15), There are a few other goodies on the Compact and easy to read menu such as Steak Frites ($21) and the Fried Chicken dinner which is only available Sunday evenings.